chicharperdesigns … and I’ve been doing so for the last 42 years, since leaving Duncan of Jordanstone College of Art in Dundee in 1975. After a very brief stint with an ad agency in London, I came back north to join BBC Glasgow as a Graphic Designer in January 1976 – the same week that my first son, Aaron, was born. At the BBC – well before the days of computer magic – my graphic, calligraphic and illustration talents were all put to good use. Two years later, in April 1978, I joined Baillie Marshall – namely Peter Baillie and Jim Marshall – at the start of an epic journey through two decades that saw us work for major national blue chip clients and become the largest independent Scottish communications group. Simon, my younger son, was born in 1979. Good times. Aged 11, I first enjoyed artistic success when I won a national handwriting competition that won me £25 and £50 for the school, Kirkcaldy High. My art teacher, Tom Gourdie MBE, world-renowned and honoured for his services to handwriting, passed on this skill to me most Tuesday afternoons for five years, forming the basis of my lifelong love for type and art. Thank you, sir. More recently, success has been golf-related, firstly with the unusual scenario of this former, long-haired rebel of an art student becoming Captain of The New Golf Club at the Home of Golf during the Open Championship year of 2005 and then with the winning of the USGA’s 2008 Herbert Warren Wind Book Award for Tom Morris – The Colossus of Golf. The 40+ years in between have not gone without recognition. In the 1980s, Baillie Marshall became a phenomenon. We quickly grew from being a provincial design company into a national advertising agency that was handling press, TV and radio for TSB Scotland, Scottish Gas, British Midland Airways, United Biscuits, Highlands & Islands Enterprise and others. Baillie Marshall diversified and became Balgray Communications Group, adding financial, interior and PR companies, with offices in Dundee, Edinburgh and London, and a printing company in Perth. By the late 1980s, we were Scotland’s largest independent communications network, employing around 200 people, with a turnover in excess of £12m per annum. During this diversity, I was producing corporate identities, designing brochures and packaging while, as Creative Director, was managing a studio of 12 graphic designers and, with co-Creative Director, Jim Greig, was creating advertising campaigns and producing TV ads, such as TSB’s ‘Which Bank?’, BMA’s ‘Flying Scotsman’, British Gas Scotland’s ‘Reasons to be Cheerfuel’, numerous campaigns for freezer foods giant, Capital Foods, as well as the infamous ‘What’s it called? – Cumbernauld’. These received national Clio, Roses and IBA Creative awards, while our ‘Newsvendor’ TV ad for TSB Scotland proved so successful that it had to be withdrawn as the customer response was proving too much for the bank to cope with. In 1991, my identity for Scottish Rugby Union – briefed on a Wednesday afternoon and designed that night – received a UK design effectiveness award for transforming the national team’s marketing potential – a £1M deal was agreed with Umbro on the day of the launch. Other major personal successes in the 1980s and 1990s included the rebranding of Cumbernauld, Highlands & Islands Enterprise, Simmers Biscuits and Walkers Shortbread. 1994 saw Balgray suddenly ‘downsize’ when our major clients – British Gas, British Midland, United Biscuits and TSB Scotland – all decided to move their marketing people down south that year. In 1995, we formed Greenfinch Design which later became Avian Communications Group when we added Turnstone Advertising, Merlin New Media and Heron PR as nest mates. During the 1990s, I continued to design for a varied client list that included print for Scottish Enterprise, Orkney Tourist board, Crieff Hydro, Lomax Mobility and Expro Group, as well as branding and packaging for Walkers Shortbread, Gleneagles Water, and the Antiquary and Talisman whisky ranges for J&W Hardies. I also created the new corporate identity for Ultratape, Scottish Golf, Sterling Furniture, NorthLink Ferries and Caithness Glass – including all their packaging, brochures and point of sale – and sub-branding for The Royal Bank of Scotland. As the web became an ever-increasingly important element of everyone’s business, web site design started to take up more of my time. The House of Bruar, Walkers Shortbread, Perthshire Tourist Board, Locate in Dundee and The Falkirk Wheel are just a few of those more prominent web design projects. In 2001, I embarked on a design project that would open a whole new chapter (pun intended) in my career. As a committee member of The New Golf Club in StAndrews at that time, I took on the job of producing the club’s centenary book, One Hundred Years New. As its ‘resident graphic designer’, I had already re-designed the club’s entire identity, from the logo, signage, tie, tartan and merchandising through to its web site. The 224-page book took two-and-a-half years to research, photograph, design and produce. On its launch in 2003, it was immediately acknowledged by golf book collectors as being significant within its marketplace. In 2004, I left Avian thinking I’d retire from graphics to start painting, in France or Italy perhaps, but after numerous phone calls from clients wanting to keep their design work with me, I was soon busy again and into my freelance business and a whole new, more enjoyable period in my life and career. I also started teaching graphics part-time at Perth College that year. That, too, was a fantastic and refreshing challenge, and an opportunity for me to put something back into the community. 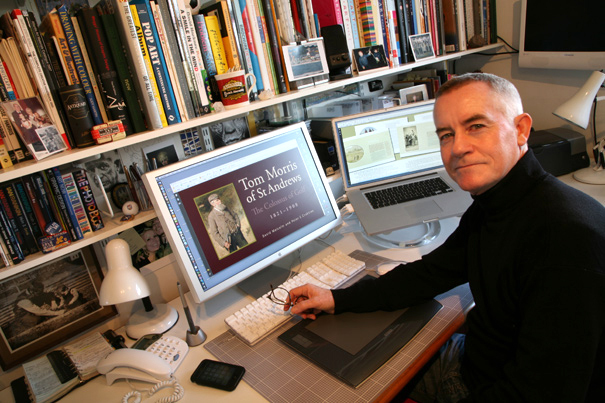 The New Club book led to a further book commission, this time to design Tom Morris – The Colossus of Golf by David Malcolm and Peter Crabtree. This book, printed in two Limited Editions, received even greater accolade from collectors and was subsequently awarded the USGA’s 2008 ‘Herbert Warren Wind Book Award’ – ‘in recognition of its high standard of achievement in golf literature’. It also won the British Golf Collectors Society 2009 Murdoch Medal for the year’s most outstanding golf publication. Priced at £975 and £395, both editions were soon sold out. This book, in turn, led to two further, significant book commissions, the first of which was Social Links – The Golf Boom in Victorian England by Cambridge author, Donald Cameron. This was launched in March 2010 by Peter Alliss and, like Tom Morris, was honoured with the Murdoch Medal. Then I was commissioned to produce Bruntsfield Links Golfing Society 1761-2011, written by Pat Colledge and produced to celebrate the 250th anniversary of this, the world’s 4th oldest golfing society. It was launched in March 2012 and received that year’s Murdoch Medal – a third win in four years. In 2009, I gave up teaching to concentrate my efforts on my design business and to the further development of my publishing company, StAndrews Golf Press, which produces limited edition books for the golf market. November 2013 saw the launch of Fair Ways in Ashdown Forest, the 125th anniversary book for Royal Ashdown Forest Golf Club, which also received the Murdoch Medal that year. In 2015, I worked on two other significant golf books with StAndrews author, Roger McStravick. Published in May 2016, StAndrews in the Footsteps of Old Tom Morris, produced in three Limited Editions – leather, hardback and soft back – was an instant success and hailed by the media and collectors as “a true golfing masterpiece” and “a book for the connoisseur”. Not only did it achieve my fifth Murdoch Medal, it was also awarded the USGA’s Herbert Warren Wind Book Award for 2016. The second book written by Roger, A History of Golf, was published in May 2017. With rare photographs and paintings throughout, with plentiful ‘Did You Know?’ questions and answers, is a lovely, informative read. April 2017 saw the launch of my latest book design, StAndrews Ladies’Golf Club, 1867-2017, which celebrates the 150th anniversary of the oldest ladies golf club in the world. This contains some wonderful, previously unseen and unpublished photographs belonging to the club, and also includes several beautiful photographs of the Children’s Golf Club of the early 1900s. Over the last year, I’ve also been working on StAndrews For Ever!, the 175th anniversary book for StAndrews Golf Club, which is due out in February 2019, and a book written by David Malcolm, author of the Tom Morris book, entitled The Golfing Strath Family of StAndrews. Several months ago, I received a most unexpected call from The Royal Liverpool Golf Club, Hoylake, asking if I would design their 150th anniversary celebration book. How could I refuse that honour? Design has already started on this and the book will be out early in 2019. Retirement? Never thought about it! I’ve been lucky enough throughout my entire career to enjoy what other people call ‘work’. Why should I stop? Meantime, in between ‘working’, I still find time to squeeze in some golf, snooker, gym, travel and photography, and enjoy life with Elaine and my growing family – I’m now a papa to two gorgeous little granddaughters – and to have fun and smell the flowers.